Northwest Music | Unit 4, Blacktown Leisure Centre, Stanhope. NSW | 0400 608177 - join today! 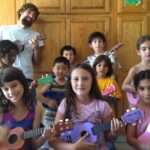 Beginners and Experienced Ukulele Players this is for YOU! Come learn from Music Rhapsody teachers who will teach you how to play this happy little instrument. Learn some easy strumming patterns and easy picking on the ukulele. Please call for available schedule 310-376-8646.